Can under 18s come on their own? No, anyone under the age of 18 must be accompanied by a parent or guardian over the age of 21. What arrangements are there for disabled visitors? Disabled visitors are eligible for concessionary tickets. There will be a free disabled visitor car park right beside the festival site. Only cars displaying the appropriate disabled stickers will be allowed in to this car park - all other cars will be directed to the main car park. The festival and campsite are both set in fields. There are some pathways around the festival site which are accessible to wheelchair providers and we are working at making additional access arrangements. Please revisit this question later or email us with specific queries (info@centreforstewardship.org.uk). Can I bring my own food and alcohol? Well you can bring food but there's a fantastic Food Village offering a huge range of affordable things to eat (so why would you?!). Alcohol cannot be brought on site. We have fully licensed bars and anyone found bringing alcohol on to the site will be asked to dispose of it. Oh, and if you look under 25 you might be asked for ID as part of the Challenge 25 initiative. Are there any parking facilities at the Big Tent? There's a large festival car park that is accessed from the A912 (Strathmiglo to Falkland road). Please please please do not try and park in the village of Falkland. With help from the police we will have stewards directing visitors to the car park and it will be clearly signed. There is a charge of £5 for a weekend space (same price for weekend as day) but if you book early, it's £4.50. Sestran have created a Tripshare scheme - visit our 'Getting Here' page for info on how to sign up. I live in Falkland and I'm worried about the traffic the festival will cause. What are you doing about it? Our relationship with the community of Falkland is really important to us and it is our aim not to encourage any vehicles to access the Big Tent via the village. Visitor traffic will be directed to the same car park as last year so that's from the Strath-Falkland road (A912). There will be plenty of signage encouraging visitors to make there way to the car park and the police and stewards will be on hand to help. 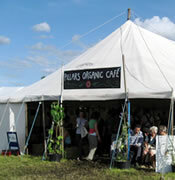 Exhibitors, traders and artists will enter the festival site via the Pillars entrance. The only vehicles encouraged to come along the High Street are the free shuttle buses to drop visitors off. Any vehicles that do venture up the High Street will be met with 'No Big Tent Access' signs on the approach to West Port. What's the best way to get to the festival by public transport? Glad you asked that. We are going out of our way to help you get to the festival by public transport this year! With our friends at Sustrans, Sestrans, Stagecoach and Scot Rail, we are putting together a multitude of affordable (often free!) ways of getting to Big Tent with as little carbon as possible. Plans are developing so come back in a bit and we'll gladly share them with you. If you lose any of your property at the Big Tent then go to the Information Desk and if we haven't found it, leave your name and contact details and we'll do our best to reunite you both. 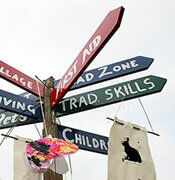 If you lose your child at the Big Tent, head to the Lost Children's Tent. All children will be given wristbands so we suggest you write your mobile number on them - just in case. 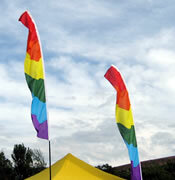 Big Tent claims to be green - prove it! We have a sustainability strategy that we follow when putting the festival together. We look at waste, transport, energy as well as awareness raising and community involvement. We are measuring the festival's carbon footprint and we'll let you know the outcome! Transport is a major contributor to a festival's carbon footprint so we are actively promoting alternative ways to come to the festival than by car. All our food traders are asked to use minimal disposables or those that are biodegradable/reusable. There will be recycling points all over the festival site and we'll have Recycling Champions helping you sort your can from your paper. We are looking at composting all food waste. We are using alternative energy sources where possible eg a solar powered cinema. We aren't perfect and we'll get some of this wrong so if you've any tips or advice then please pass them our way. What are the campsite opening hours? The campsite will be open from 10am on Friday 23rd July and close at 12 noon on Monday 26th July. Please arrive before 8pm on Friday 23rd July. Sadly no. Our campsite is only suitable for tents. Please heed this and don't come with a caravan or campervan - you won't get in, you'll block the traffic and you'll annoy the police. Can I park my car beside my tent? No, in the interest of safety, this is a vehicle free campsite. We aim to park campers as near to their cars as possible (in the car park) but you won't be able to park directly next to your tent. Is there a Family Area in the Campsite? Yes there is. We have a designated "Quiet Zone" for families. Request it when you arrive but it's on a first come first served basis. What do we get for our camping ticket? There's showers and toilets and there will be a campsite shop and café for campers. Obviously you also get full access to the festival (check opening times) and a chance to explore Falkland Estate at your leisure.